When one of the world’s leading specialist insurers commissioned an installation to reflect both the identity of the organisation and the vital data that informs their business, one particular material met all the aesthetic and performance demands of the brief. 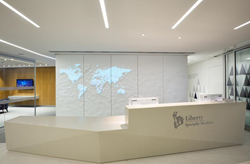 Created by The Agency of Design, a digitally augmented, sculptural mural made from DuPont™ Corian® now greets visitors to the London offices of Liberty Specialty Markets. About The Agency of Design - The Agency of Design works at the junction of our physical and digital worlds designing new products and experiences. A group of designers, engineers and strategists with a track record of bringing products to market, their work is recognised at an international level. A hybrid creative and technical process enables the group to work with clients ranging from medical start-ups to global organisations such as Liberty Specialty Markets. About Liberty Specialty Markets - Liberty Specialty Markets offers specialty and commercial insurance and reinsurance products across key UK, European, Middle East, US and other international locations. We provide brokers and insureds with a broad product range through both the Company and Lloyd’s markets and have approximately 1,000 employees in 22 offices. libertyspecialtymarkets.com. About DuPont™ Corian® (http://www.corian.co.uk) - First created as a high performance material for kitchen and bathroom worktops, DuPont™ Corian® is now - thanks to its unique combination of functionality, versatility and beauty - a leading global brand in surfacing materials for interior design and architecture. Over the years, DuPont has established DuPont™ Corian® advanced surface as an exceptional design tool for every application one can imagine. Kitchens, bathrooms, lighting, furnishing, facades, seating, radiators, home automation, touch control surfaces: today, DuPont™ Corian® can be found almost everywhere in Commercial, Residential and Public Space applications. About DuPont – DuPont has been bringing world-class science and engineering to the global marketplace in the form of innovative products, materials, and services since 1802. The company believes that by collaborating with customers, governments, NGOs, and thought leaders we can help find solutions to such global challenges as providing enough healthy food for people everywhere, decreasing dependence on fossil fuels, and protecting life and the environment. The DuPont oval logo, DuPont™, Corian®, Endless Evolution and the Endless Evolution logo are registered trademarks or trademarks or copyrighted material of E. I. du Pont de Nemours and Company or its affiliates. Other logos, trademarks and registered trademarks are a property of their respective owners. Only DuPont produces Corian®.